Wasn't me. I didn't do it! 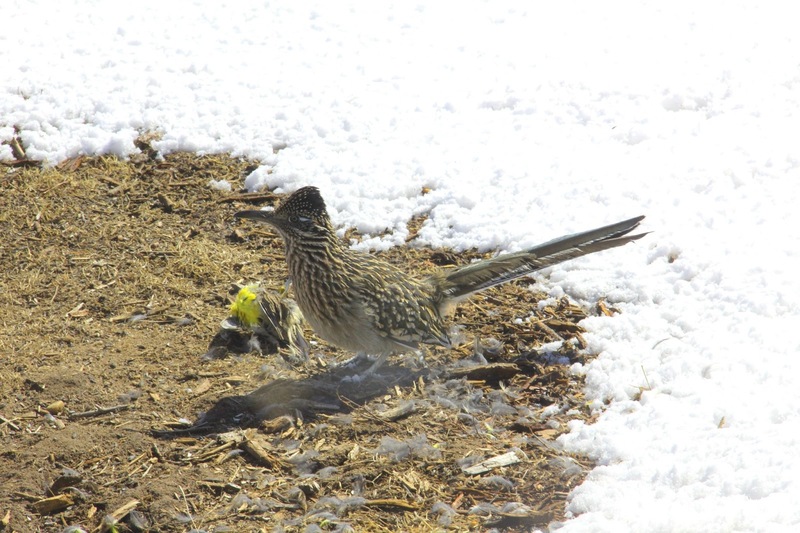 One of our "pet" Greater Roadrunners, Gerry, seems mighty suspicious as he looms over a dead Western Meadowlark. Roadrunners will eat small birds and I'm sure in times of harsh weather and stress, even our slightly domesticated roadrunner will look over the offerings at our bird feeders. This Western Meadowlark had been hanging around for several days, pecking for food in the same, specific location. Then, one day, I found it dead. I did not witness the roadrunner kill it. This picture was taken the same day I discovered the dead bird but a little while later. Gerry had come up for a regular feeding of deerburger (look at older blogs for background) and then lingered around the meadowlark carcass. I waited to see if he was going to eat it or carry off his booty. He didn't touch it. So after he left, I inspected the dead bird. It was emaciated and had hardly no breast muscle. Also, it did not show any puncture wounds so it was clear that Gerry did not commit this murder. I surmised this bird simply died of natural causes and most likely starvation was a factor even though overwintering meadowlarks are common here. So, Gerry is off the hook for this one!